I seriously could not be farther from a Stepford Wife that however does not negate the fact that I get super excited when something arrives for Mr. Hubs. The RFID Blocking Men’s Leather Wallet by ID-Locker arrived today and I am soooo happy -- I can’t wait for my husband to get home so that I can present him with this! The RFID Blocking Men’s Leather Wallet by ID-Locker quality begins with packaging and presentation. It arrived very well packaged to ensure that the wallet did not get damaged during shipping and it arrives ready to give! The wallet arrives inside a cloth bag and giftable box. It’s a really high-end touch. The wallet itself is made of quality soft leather and the stitching is consistent throughout. 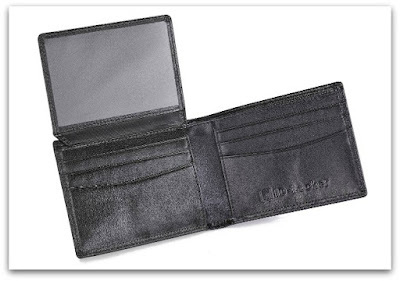 The wallet has a slim design, but offers plenty of room for ID, credit cards and money. It’s actually smartly designed with a fold over pocket specifically for ID. If you’re looking for a nice Valentine’s Day Gift, this is it! The RFID Blocking Men’s Leather Wallet by ID-Locker is a bargain at $39.99, but it is currently selling for $27.95 so if you’re in the market for a RFID Blocking wallet or a wallet period, this is THE one that I’m recommending!